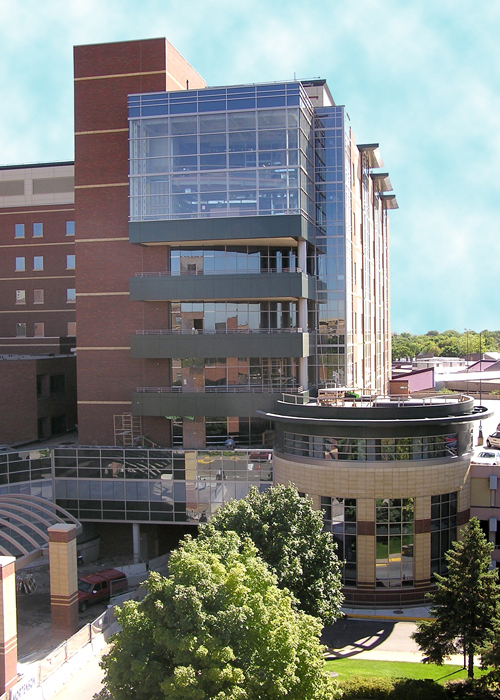 A full service acute care facility for heart disease management, teaching, and clinical research, the new nine-level Heart Hospital was completed following 28 months of construction. The cast-in-place concrete and structural steel facility adds 412,000 square feet and 128 beds – 32 of which are critical care – to the hospital campus. Structural design included remediation of an uncharted landfill and the sequencing of construction over a roadway, all without inhibiting the functioning of adjacent buildings on a very busy campus. 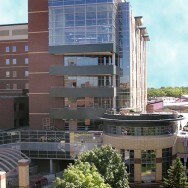 The building overlies and connects to three previous phases of hospital construction with story heights as shallow as 12’-6”. To assist the extension of the building over the nearby roadway and up to an existing parking ramp, a cantilever to the slab edge provides clearance for new footings. Cast-in-place concrete shear walls combined with unbraced frames resist lateral loads.